I am of firm believer that everyone should go on a road trip at least once in their lives. I don’t mean a long car journey somewhere – that doesn’t count. I mean a proper road trip. One that lasts days of driving to places, and stopping when you feel like it. One where you pull over at the last minute in a tiny little rest stop on the side of the road and fumble with your bags in the dying sunlight. One that sees you sitting in front of a fire surrounded by people you’ve only just met; people you’re probably never going to see again, and drinking warm beer because the ice in your esky has melted. One where the only shower you have for three days is a water hole that may or may not have crocodiles in it. 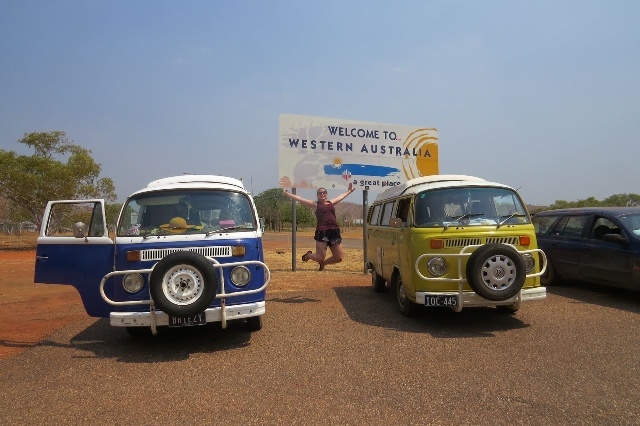 For the past ten days or so I’ve been travelling west across Australia in a convoy of two Kombis and a Ford Falcon. We’ve scaled 1900km from Darwin to Broome and taken in all the sights along the way. After Wangi, we spent the day with permanently wet hair and soggy swimmers as we went on a swimming hole crawl stopping at Buley Rockhole, the cascade pools and stopping off at Florence Falls. After Litchfield we made our way down to Katherine, picked up two German boys in the Ford Falcon and set off for the WA border. 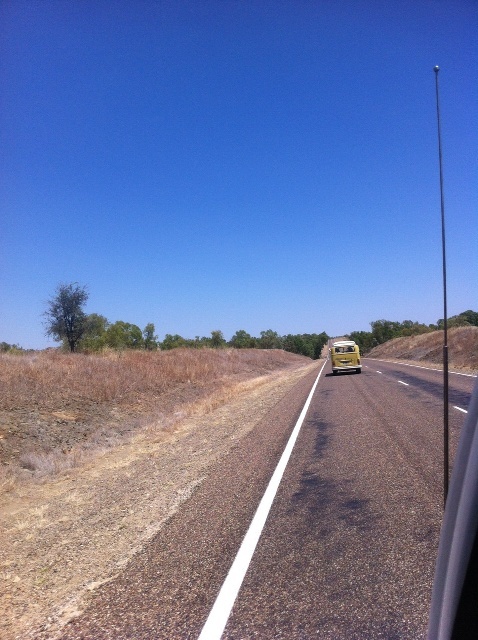 They say you should take the road less travelled and I believe we took that road to Broome. The sealed road may not seem as exciting as the rougher 4WD road but there were times when we had the road to ourselves. Just a couple of Kombis, a Ford Falcon and a couple of road trains. And let me tell you, there really isn’t anything better than seeing the road stretching out in front of you knowing that the only cars on the road are you and your friends. We may not have seen some of the things on the way but we definitely saw enough. I’ve come to expect the Australian landscape to change so significantly from one state to the next and Western Australia is no exception. The red dirt is still there, as vivid as always, but now it lines the rugged coast instead of dried up creeks. The highway is lined by fat boab trees, their strange branches reaching up in all directions. Of course the sky is still blue and it’s still hot. After a day in Derby, a sweet little town near Broome full of beautiful art galleries (especially the Mowanjum gallery just down the Gibb River Road, which showcases mesmerising paintings featuring the haunting Wandjinas), shady parks with locals carving Boab tree nuts and our first glimpse of the coast. And now Broome. Brilliantly eccentric Broome. We’ve been here for almost a week, camping on the drive of someone we met at a bar. I think that’s what I’ll miss most about this road trip: the crazy spontaneity of it all. 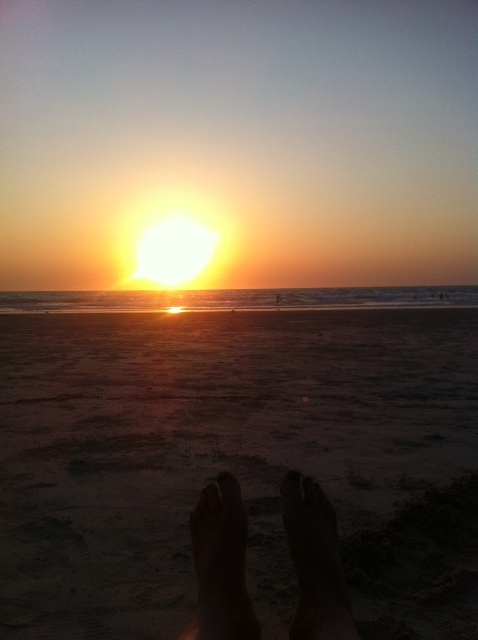 But luckily my road trip isn’t going to end in Broome because I decided to stay with these guys for three more weeks. I’ve covered a lot of kilometres in those five months and I’ve travelled on various modes of transport. But for the next 2500km to Perth I’ll be seeing it through a window of a Kombi called Skye following another called Sunnie. I guess when you find the right situation and, more vitally, the right people, you’d be stupid to give it up! But anyway, the sun’s about to set and we’re all making sand sculptures. See you in Perth, guys! This entry was posted in Featured, Travel and tagged australia, on the run on my own, travel. Bookmark the permalink.